The story of Joe the Cat was one that my four legged furiends as well as humans who detest animal cruelty are well aware of. Joe was shot multiple times with a pellet gun by an evil human, but he has recovered and now is an advocate for cat rescue and against animal cruelty. He shared a sad story recently that shows how important it is that you two legged creatures that love us felines continue to support cat rescue groups. Cat Chance is a cat rescue and trap, neuter and return group that operates in Sarnia, Ontario. They recently came upon a feline who was in bad shape. Cove Angel was living in Canatara Park, and was dealing with the challenges of fending off predators like coyotes, foxes, and owls. Fortunately for her, a kind elderly human was providing food for the felines in the park, so she did not have to worry about noms too much. Humans had noticed that she was starting to show redness in her face, and that is when the cat rescue specialists at Cat Chance decided to help her. Cove Angel did not fuss when she was taken to the humans in white coats. 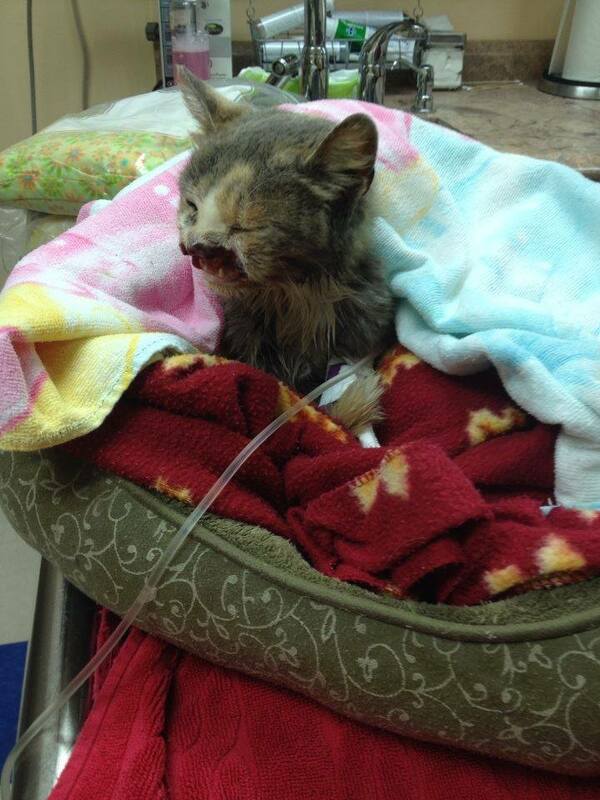 There, she was immediately given pain medication so that she was not suffering. Upon seeing the wound on Cove Angel’s face, the humans in white coats cleaned and disinfected the wound. Once this was done, it became clear that Cove Angel’s upper lips and nasal tissue had been destroyed. The humans in white coats treated her as best they could, and she started to show signs of improvement. Cove Angel started to eat noms, and while she could not make any sounds, her throat would vibrate like she was purring. You can see from this video, my furiends, that she was not a feral cat. She had been loved by a human at one point, and she knew how to show humans she appreciated it. Cove Angel started to sleep like a feline normally does, with her head and tail curled together. Everyone was optimistic that this would be a happy cat rescue. It was not to be. The damage done to Cove Angel’s body was just too much for her. She was curled up asleep with a resting heart rate of less than ten beats a minute. For healthy felines, our heart normally beats between 140 and 220 times each minute. This was the end for Cove Angel, and she peacefully left us soon after. The humans in white coats believe that she was willing to be captured by the cat rescue specialists at Cat Chance because she knew it was time to go and she wanted to be with humans who would care for her and help make the transition easier. I am sad that Cove Angel had to leave us, but I am happy that there are cat rescue groups like Cat Chance who help make the journey one surrounded by love.